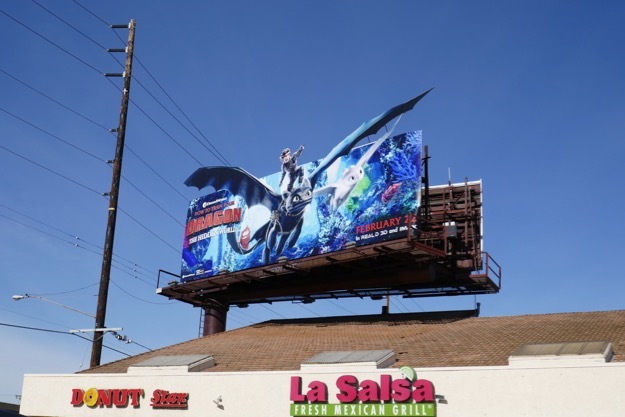 Welcome to another week here at Daily Billboard, are you ready to let your imagination take flight with another collection of fantastic outdoor ads entertaining the skies of L.A. of late? 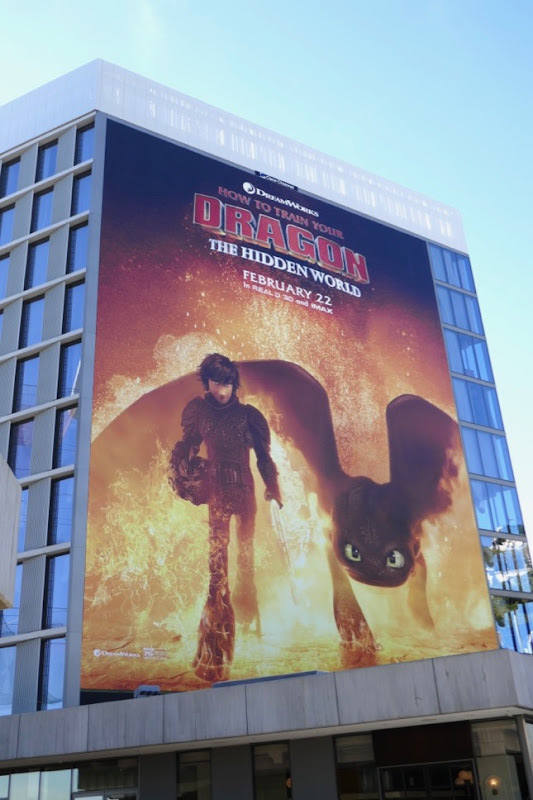 The ingenious Viking 'Hiccup' (voiced by Jay Baruchel) and his Night Fury dragon 'Toothless' are back for a third big screen adventure in How to Train Your Dragon: The Hidden World. 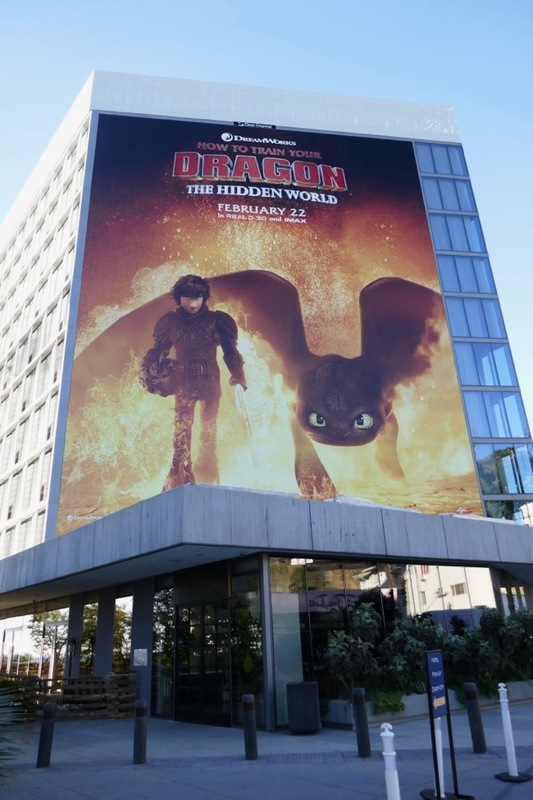 This time around Toothless discovers he's not the only one of his kind as he's tempted by an elusive white Light Fury dragon as a potential mate, whilst Hiccup and his Viking friends from the village of Berk must work together to save a hidden dragon utopia from an infamous dragon hunter. 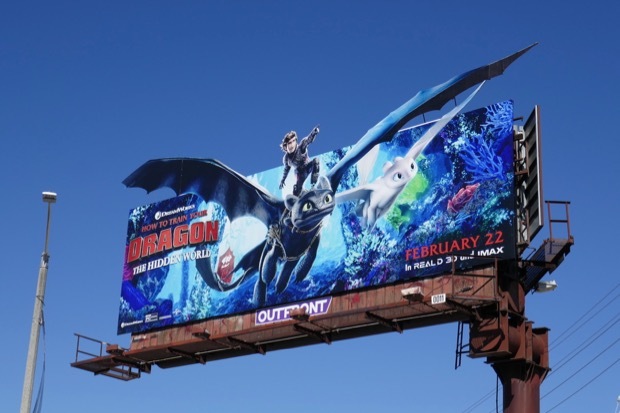 These arresting movie sequel billboards were photographed along the Sunset Strip, Highland Avenue, La Brea Avenue, Beverly Boulevard and Pico Boulevard from January 24 to February 6, 2019. 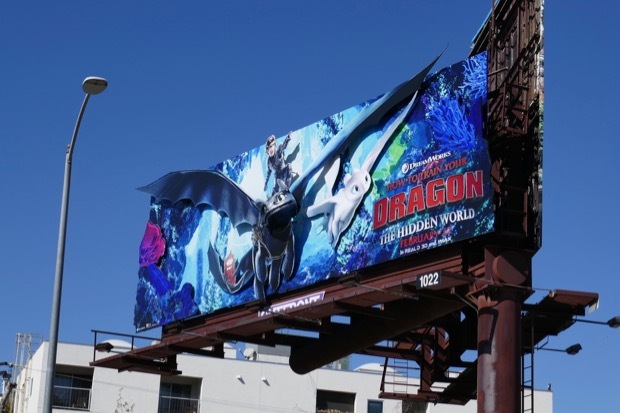 The winged special extension cut-out billboards really stand out in the city skyline this month and so does this extra-dimensional 3D billboard installation with Toothless' smiling head poking out. 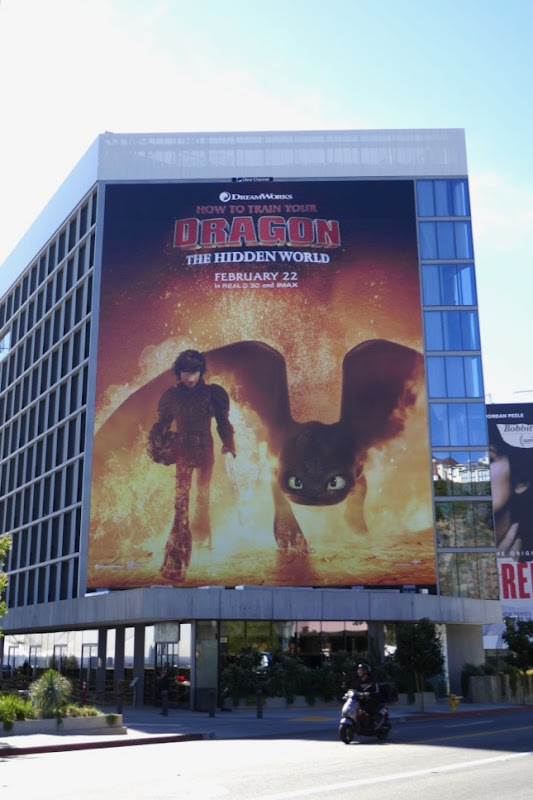 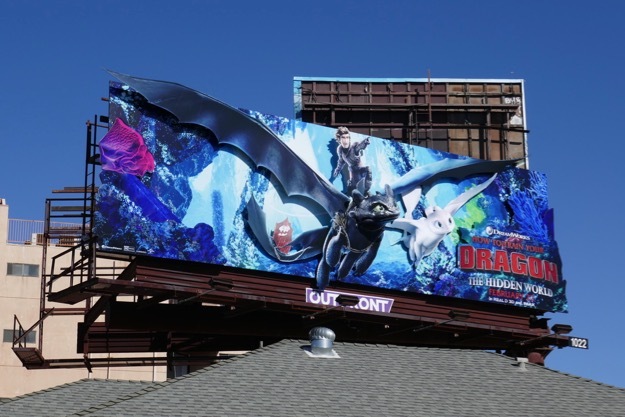 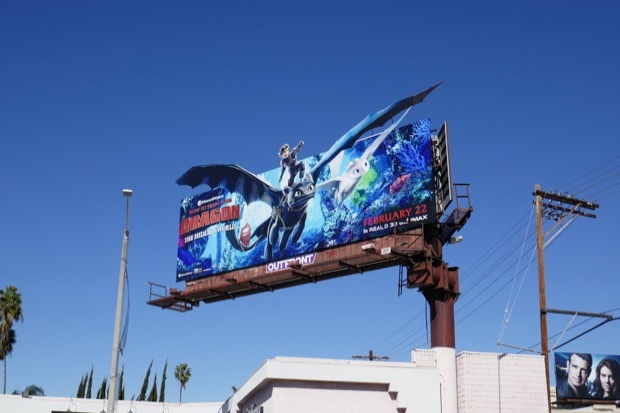 Fans of the characters and the computer-animated film franchise can also enjoy these previous How to Train Your Dragon movie billboards. 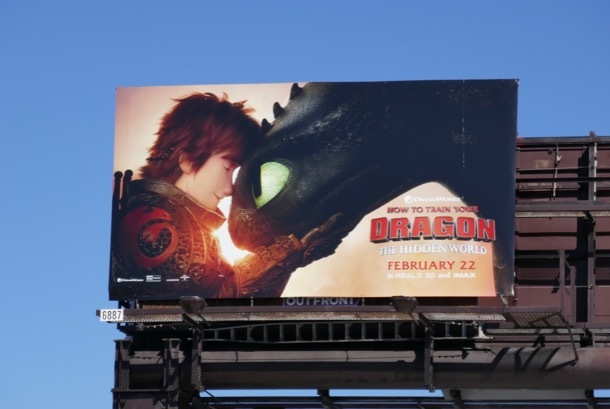 Dragon lovers can also check out these Game of Thrones billboards, these Pete's Dragon movie billboards and these billboards for The Lego Ninjago Movie. 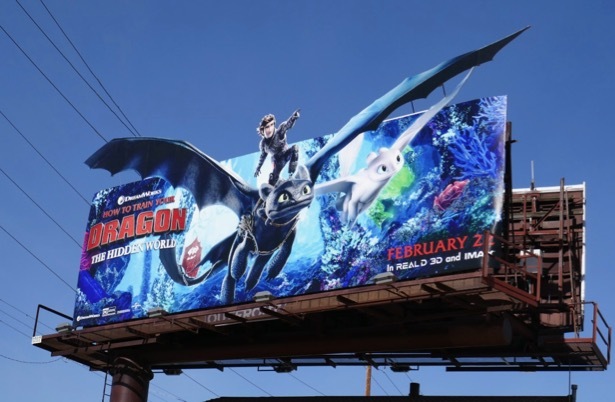 The first movie in 2010 grossed over $495 million and the second installment in 2014 over $621 million at the global box office for DreamWorks Animation, so let's see how high this third movie can soar. 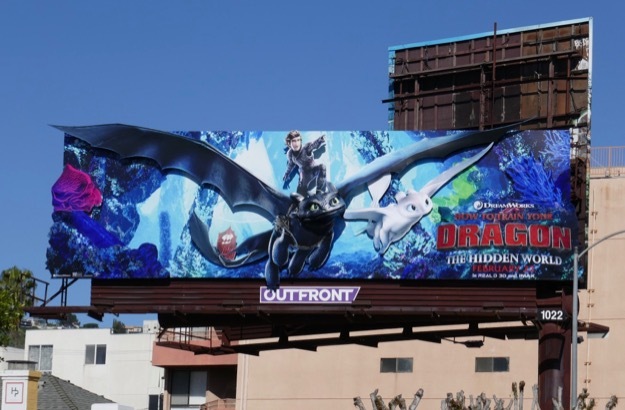 During their adventures Hiccup has already lost a leg and Toothless a tail fin, so let's hope these two beloved characters make it out alive in the final installment in this animated trilogy.